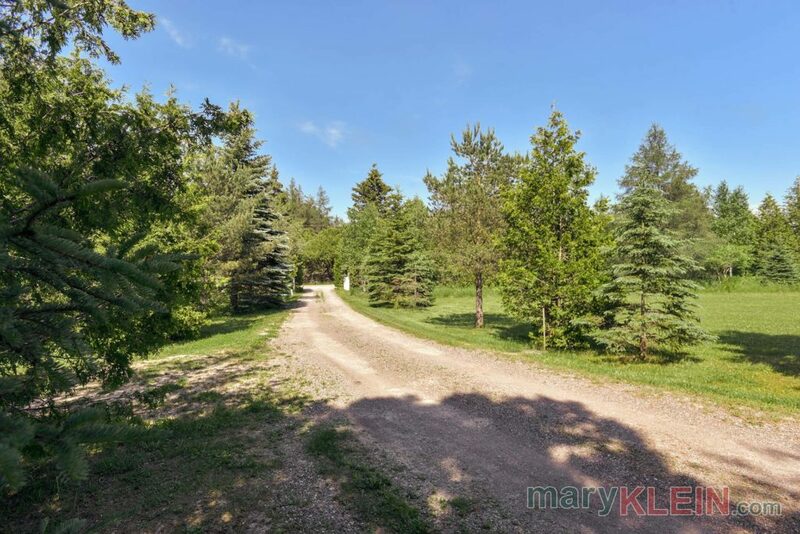 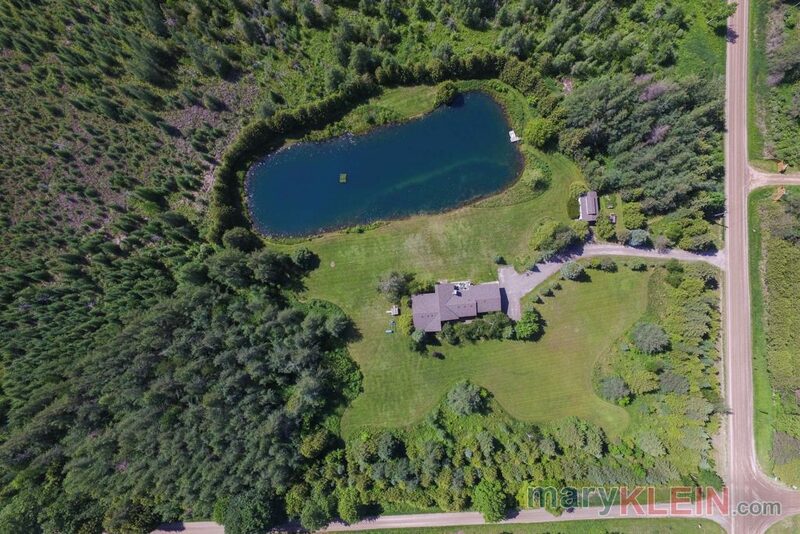 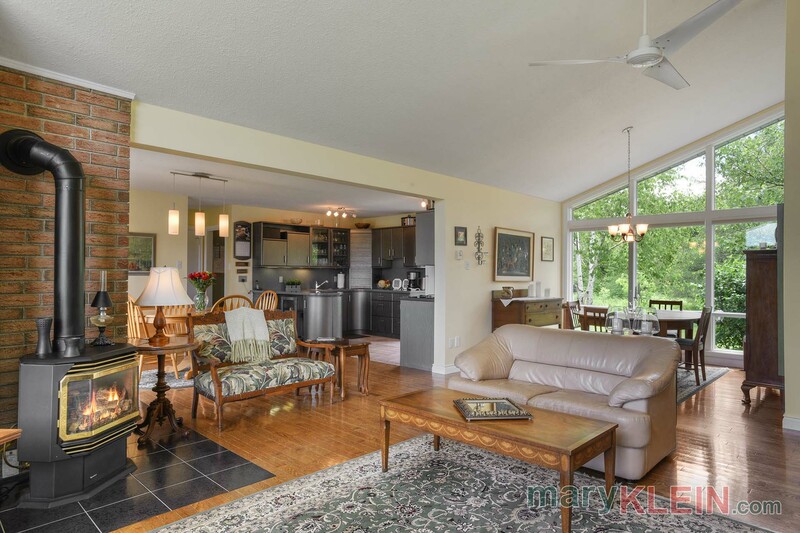 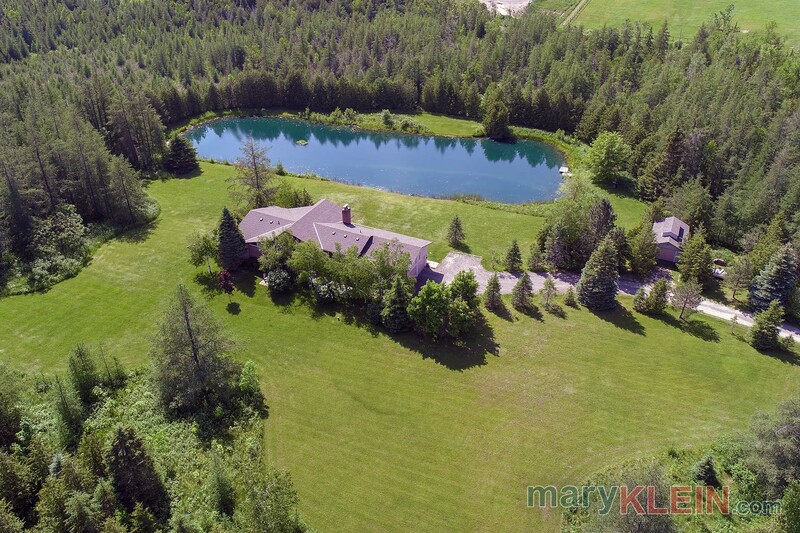 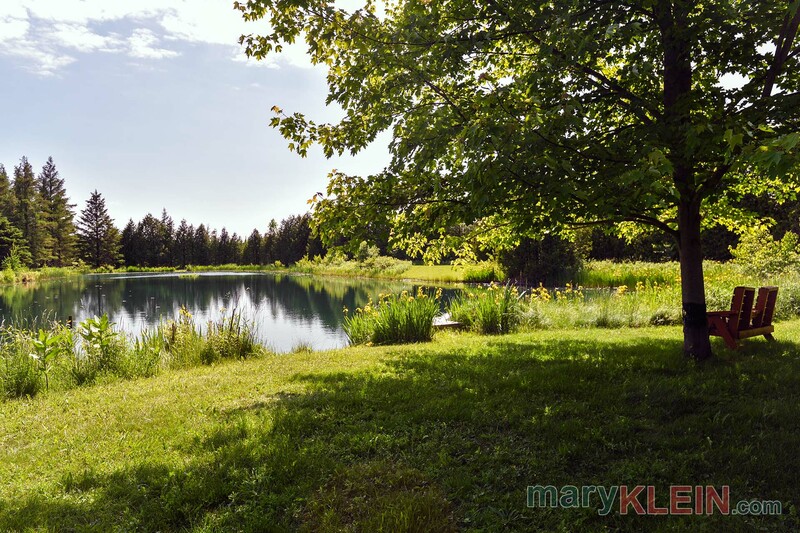 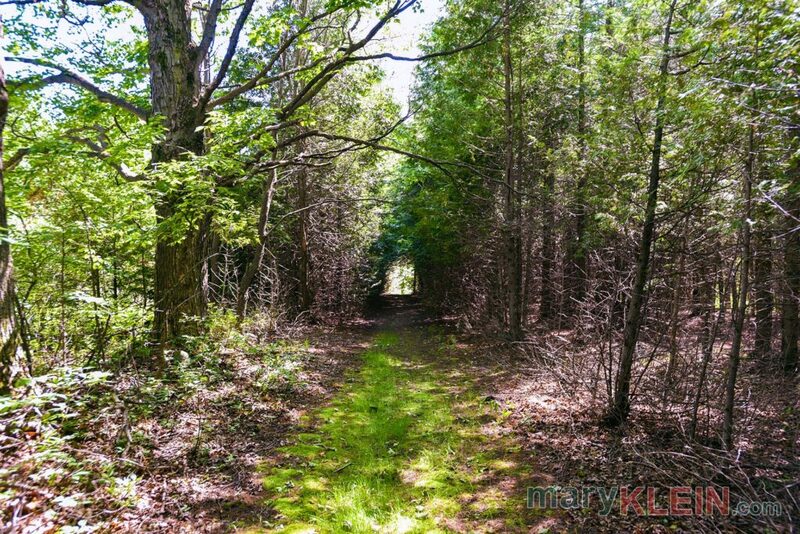 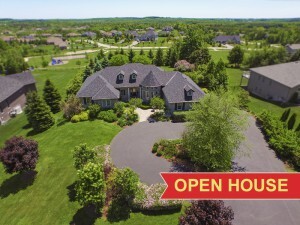 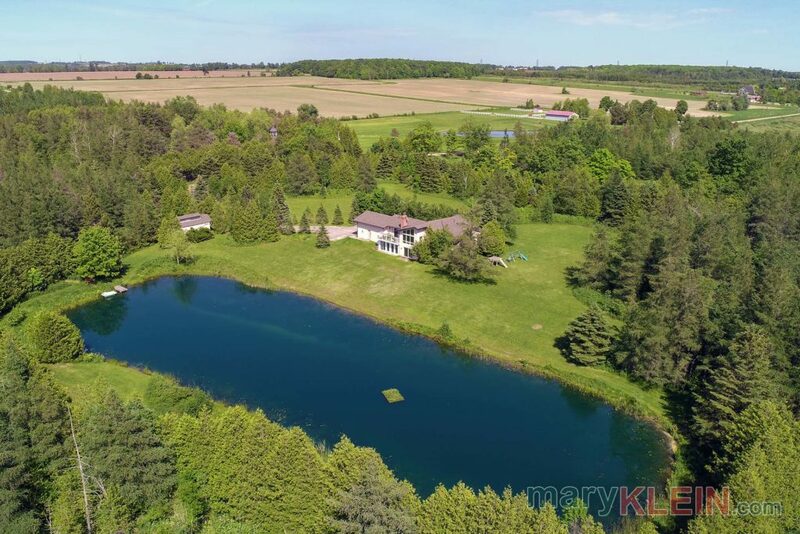 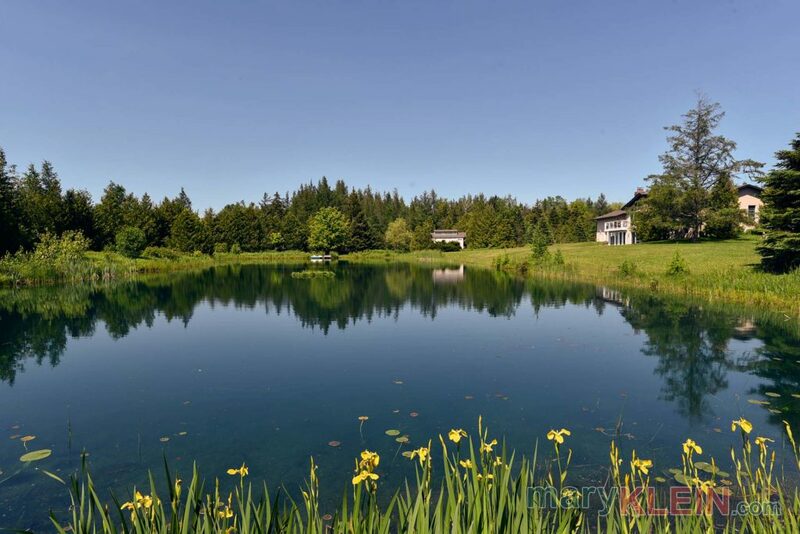 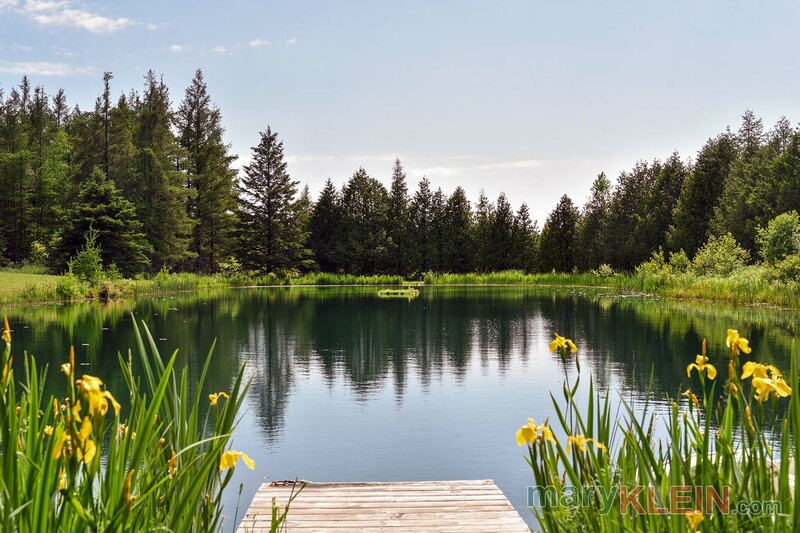 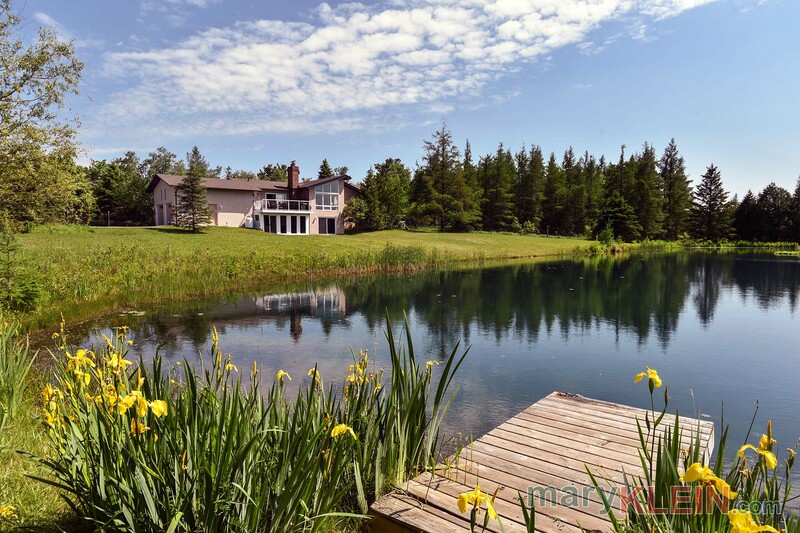 Located a mere 10 minute drive from Orangeville, this spectacular 8.11 acre property (545 x 650 ft.) has a ¾ acre pristine pond with manicured trails through forested areas. 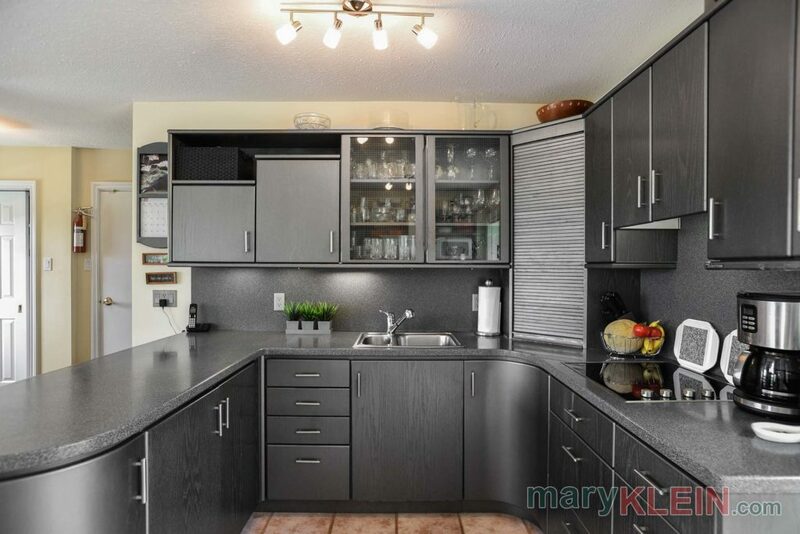 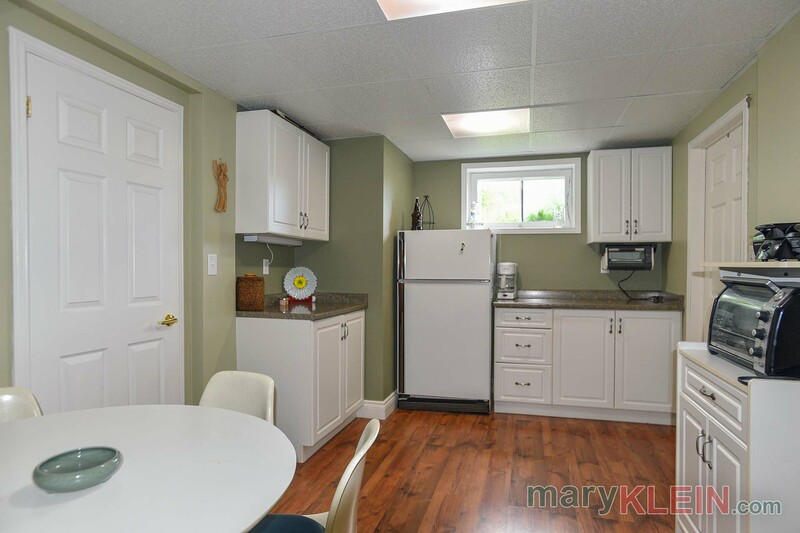 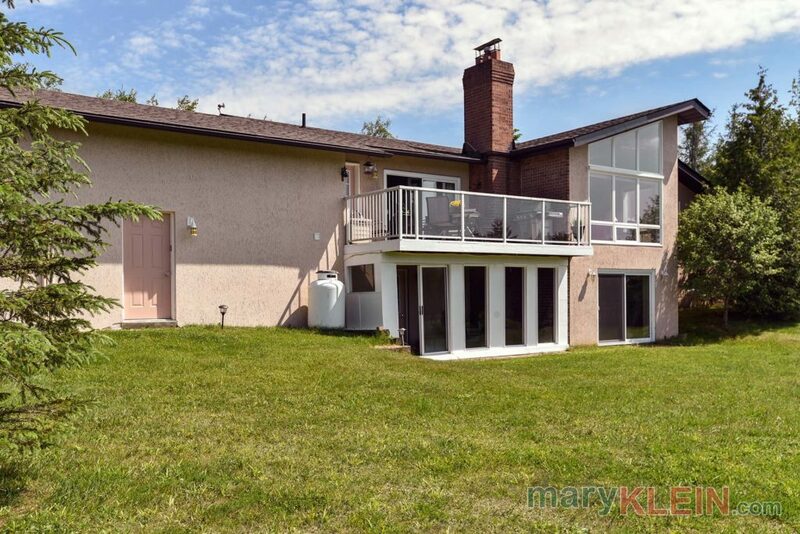 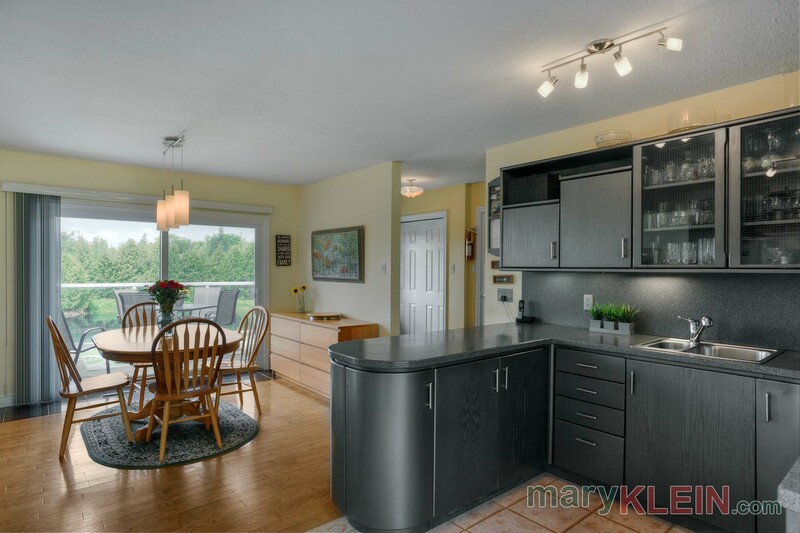 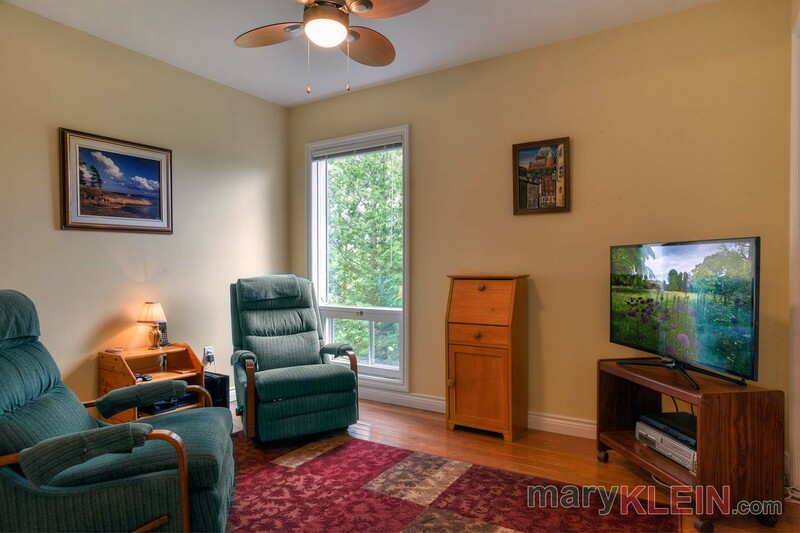 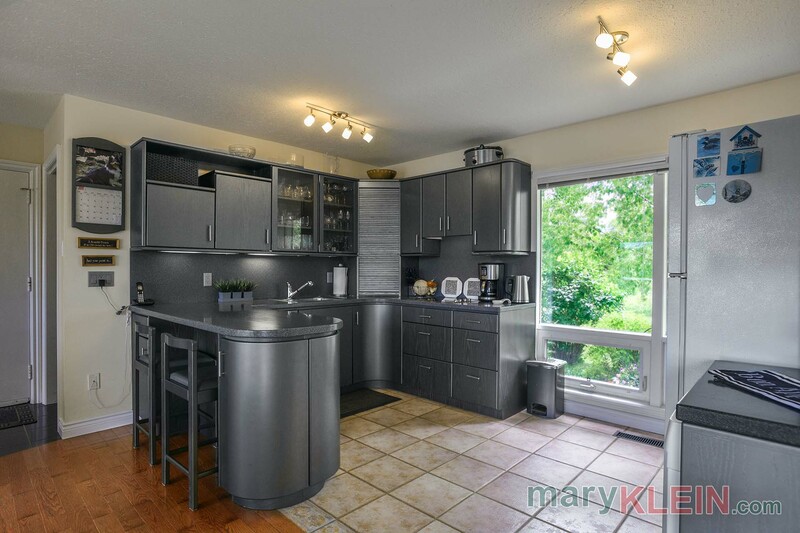 A well maintained, open concept 3+1 bedroom, 3 bathroom, raised bungalow with an attached 2-car garage, has a finished walk-out basement family room, 4th bedroom, workshop, office, 3-pc bath, kitchenette area, 2 storage rooms, cold room, and utility room. 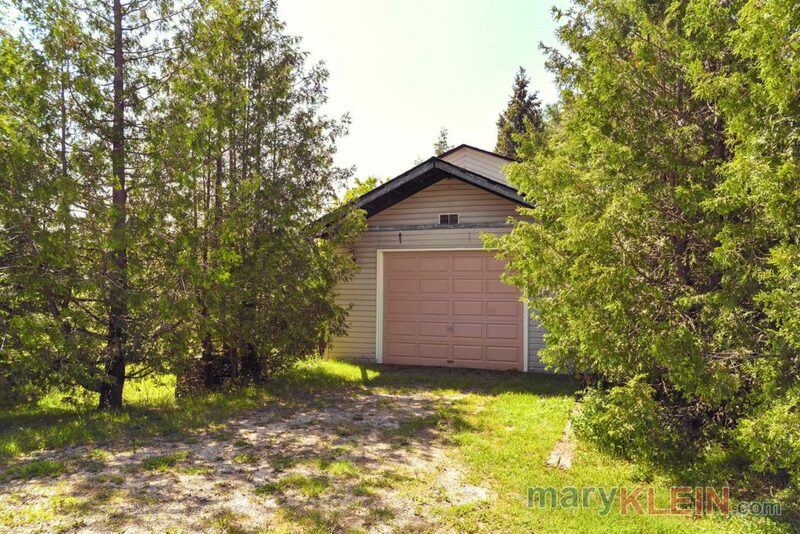 A detached, 16 x 24 ft. workshop/shed or garage is located near the entrance to the property. 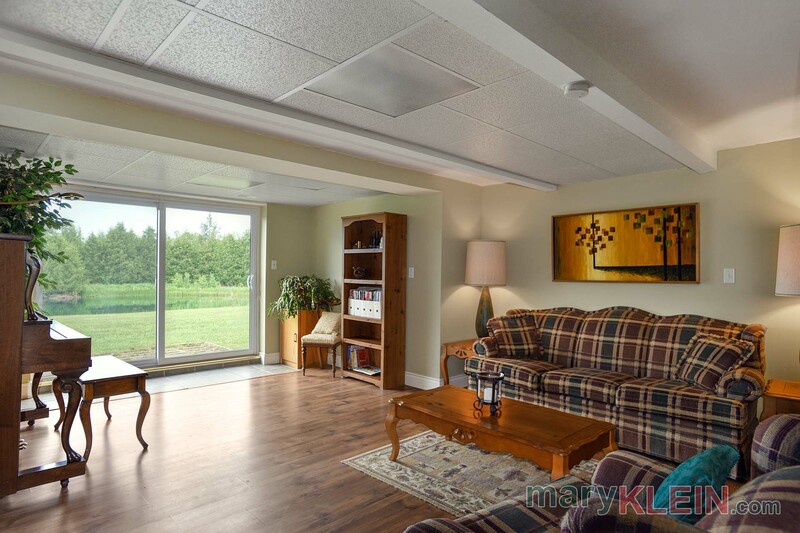 This energy efficient home has geothermal heating/air conditioning and the average cost per month for hydro and heat is $300, which also covers the outside sentinel light rental. Propane is used for barbecue cooking and the main floor fireplace, which is an additional $385 per year for the present owner. 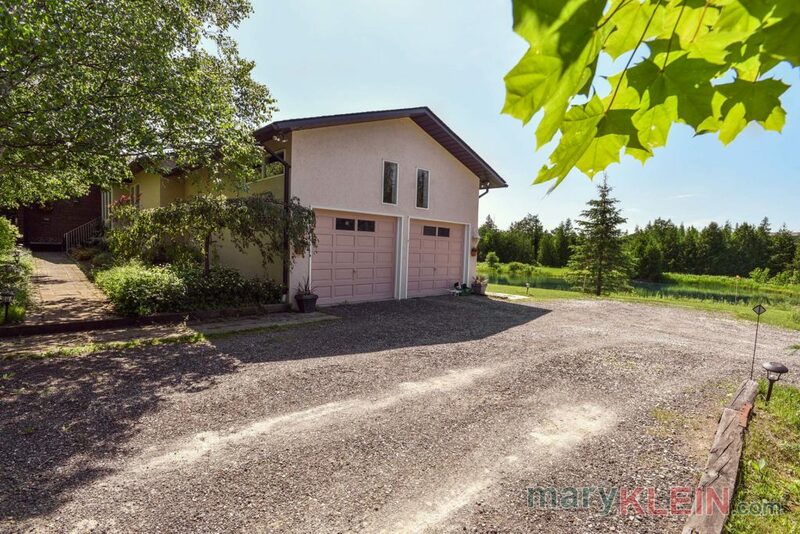 A long driveway leads past the shed/workshop and up to the garage section of the home which has an extra parking area and a walkway leads to the front door. 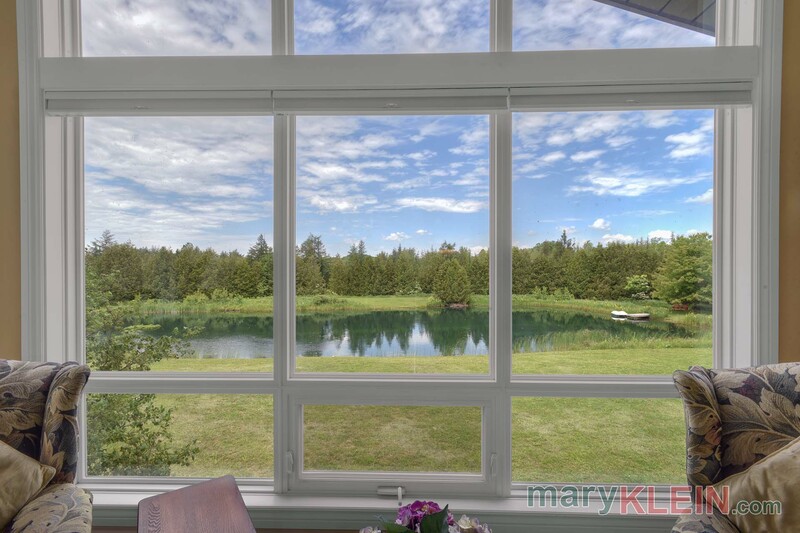 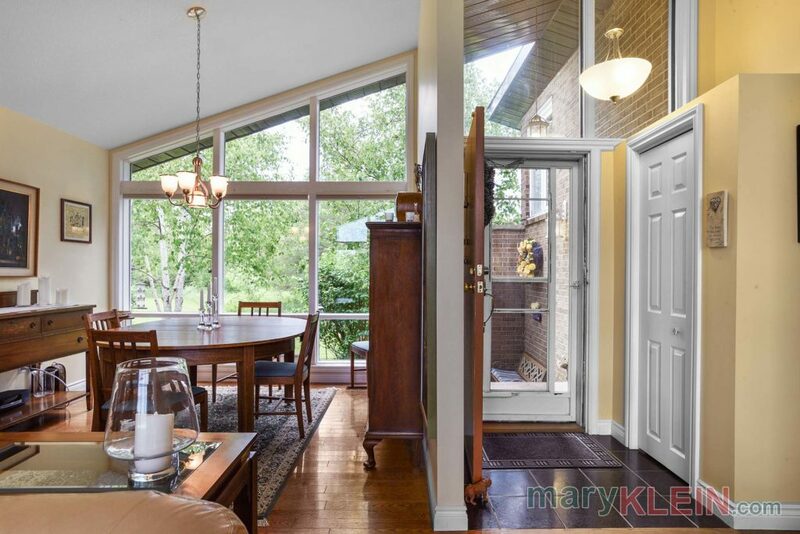 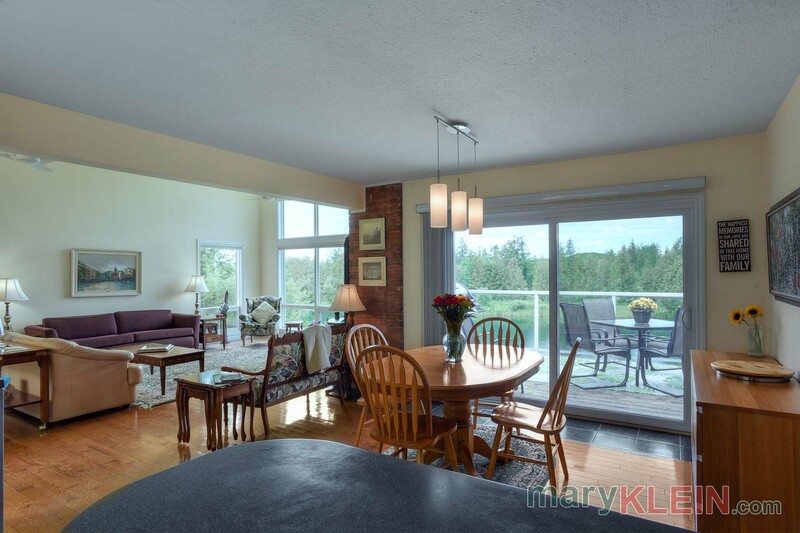 As one enters into the open concept Great Room, the floor-to-ceiling windows showcase a stunning view of the pond which captures your immediate attention. 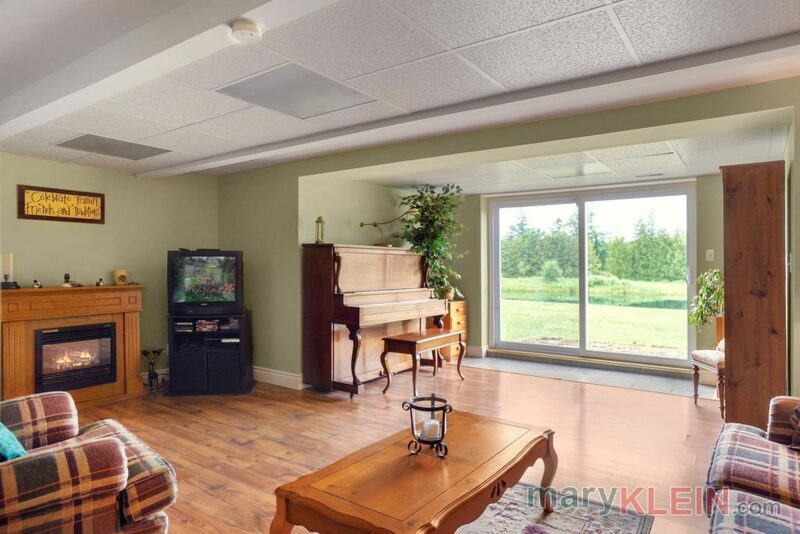 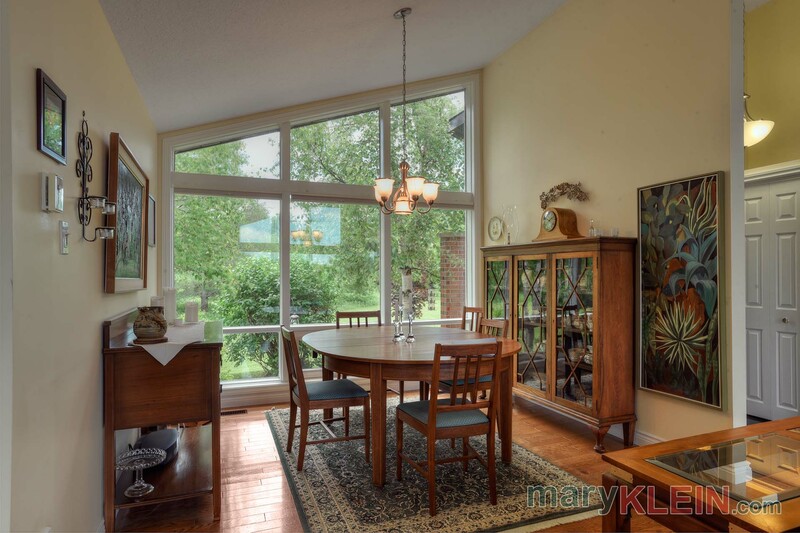 There are 12-foot high vaulted ceilings, a propane fireplace, custom blinds and hardwood floors in this room, which is open concept with the Dining Room and the Kitchen…a great space for entertaining! The “Beckerman” Kitchen has rounded cabinetry, Corian countertops, built-in appliances including an electric stovetop and oven, track lighting, and a breakfast bar with 2 stools. 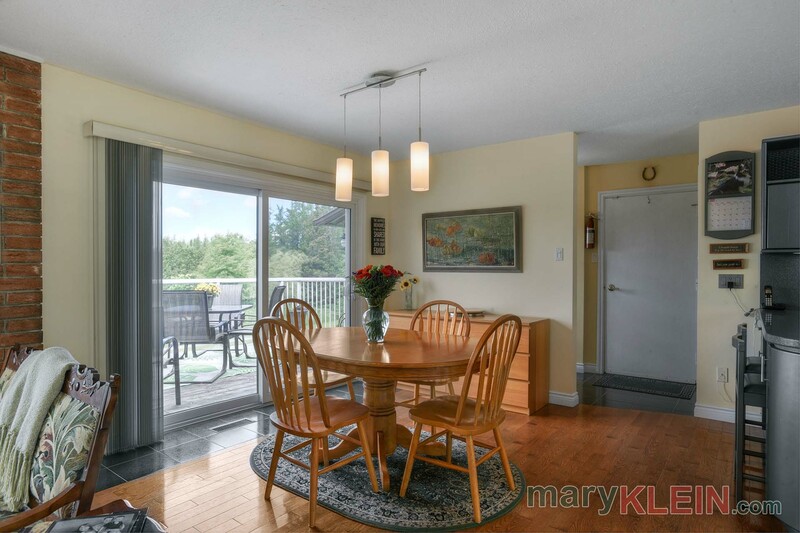 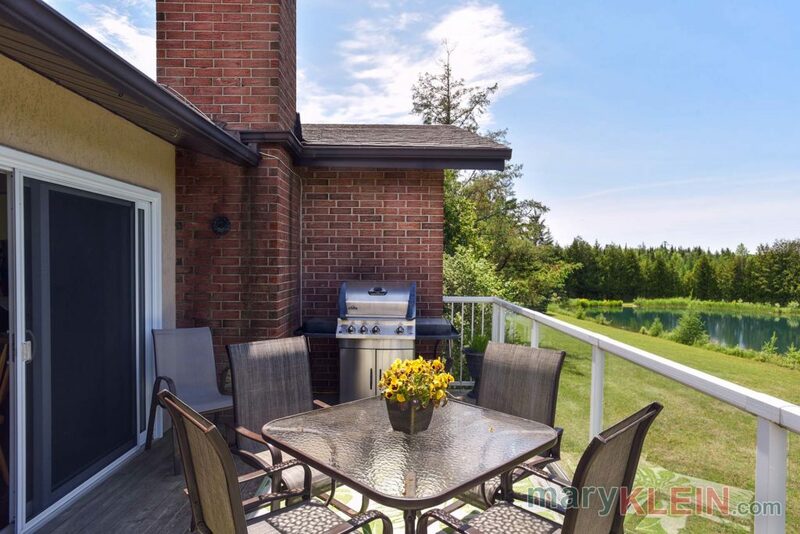 There is ample room for a generously sized table and an oversized slider door walks out onto the deck. 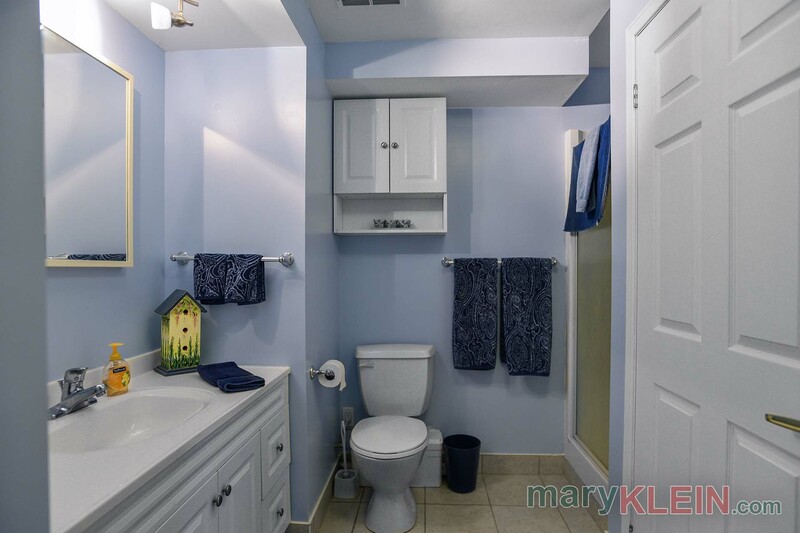 The Laundry Room has a stackable washer and dryer plus a laundry sink, and is located in the hallway leading to the man door out to the deck. 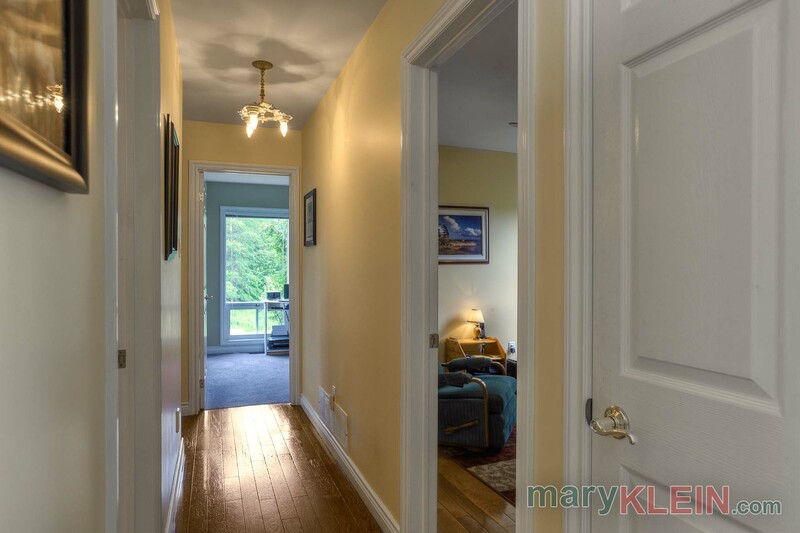 Access to the attached, oversized, 24 x 24 foot garage is also in this hallway. 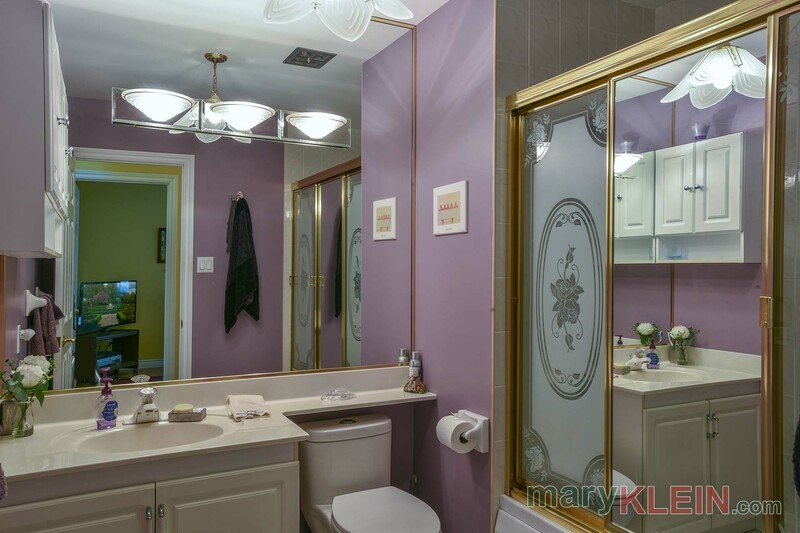 The Master Bedroom has broadloom, vaulted ceilings, a built-in makeup vanity, “his and hers” closets, and a 3-piece bright ensuite with soaring windows above the vanity and shower. 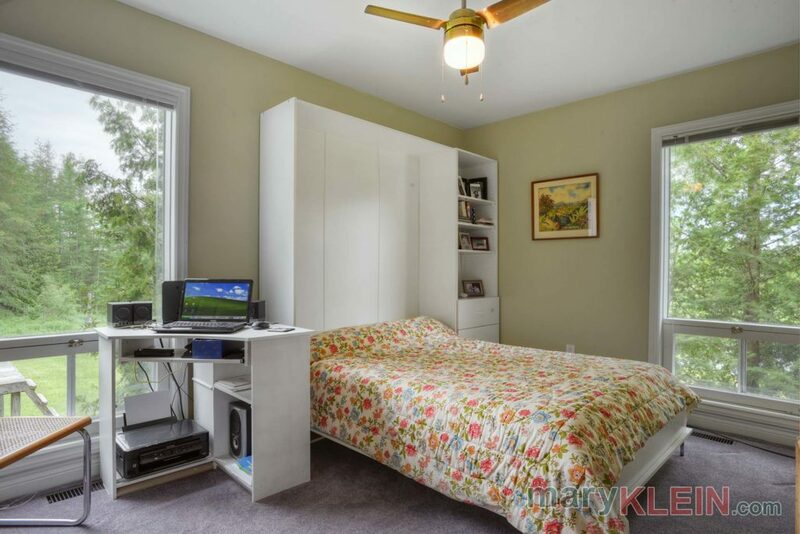 Bedroom #2 has oak hardwood flooring, a double closet, ceiling fan and a window pond view. 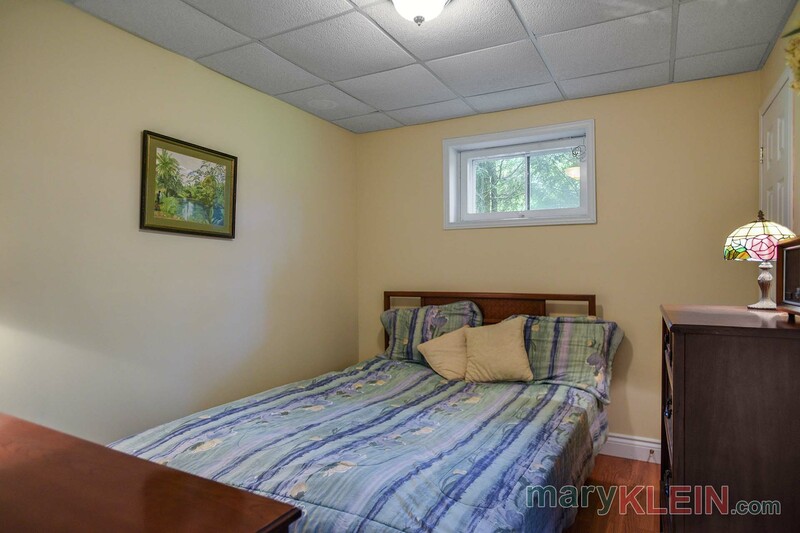 Bedroom #3 has broadloom, a double door closet, single closet, and pond view. A 4-piece Main Bathroom has a newer toilet and a jacuzzi tub. The Lower Level has an Office or Computer Room at the bottom of the stairs with laminate flooring. 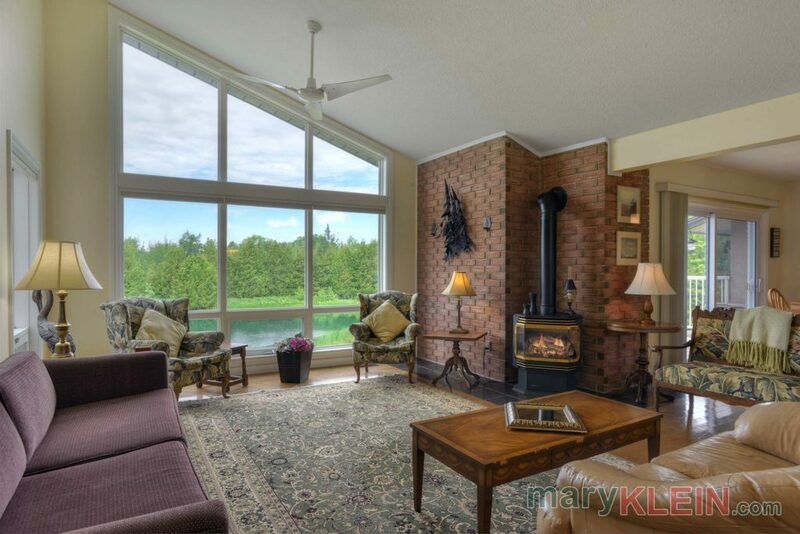 The Family Room has laminate flooring, a suspended ceiling, an electric fireplace and an oversized sliding door walkout to the pond. 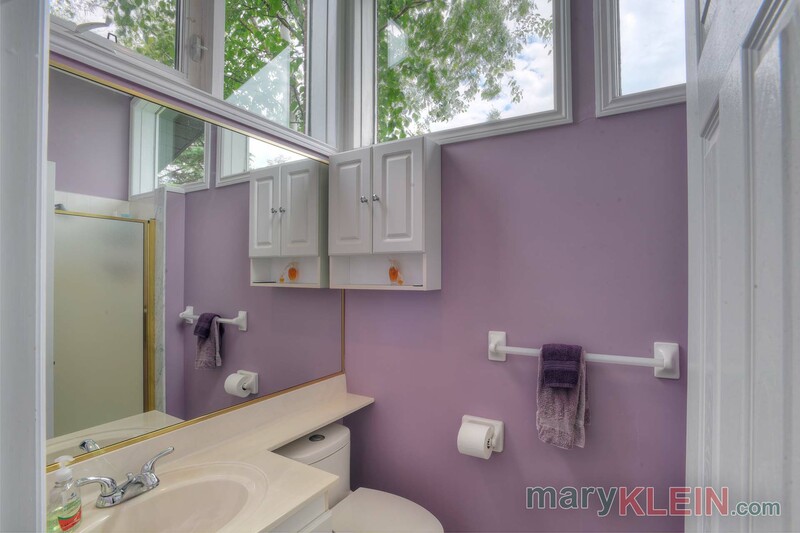 A 4th Bedroom has laminate flooring, a window and a 3-piece Ensuite. There is a small Kitchenette which has a counter top and 2nd fridge, but no sink or stove. An unfinished Workshop could be finished as a 5th Bedroom as it has three above-ground windows. There are two storage rooms, plus a Cold Room. 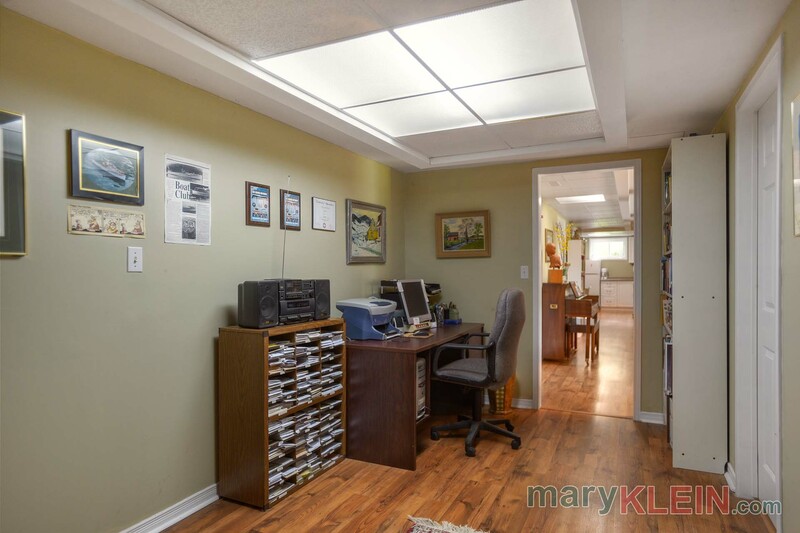 The Furnace Room has the geo- thermal furnace installed in 2008, a 200 amp panel plus pony panel, hot water heater, and a central vacuum system with an extra outlet for future installation into the garage.  The water softener is a rental at $20 per month (10 years starting Nov, 2013). 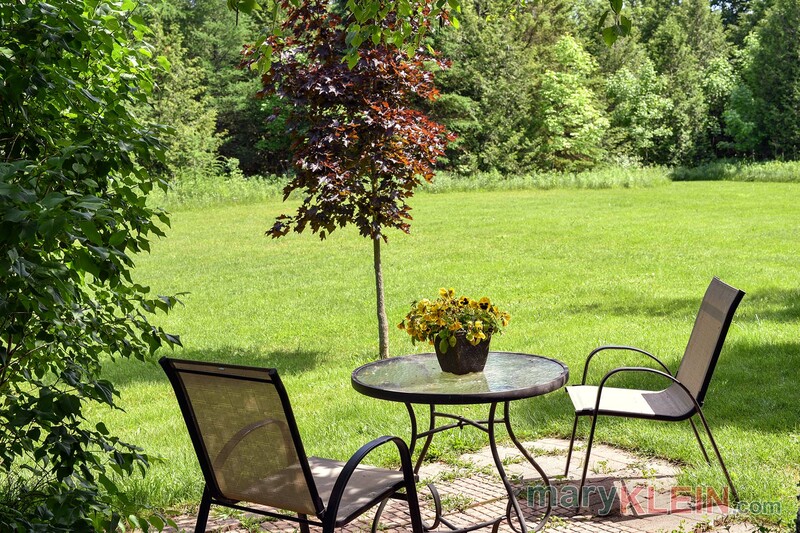 The septic is located on the west side by the master bedroom, and the drilled well is in front near the walkway. Built in 1986, the home has 1432 square feet on the main level with 900 square feet finished in the lower level per MPAC. 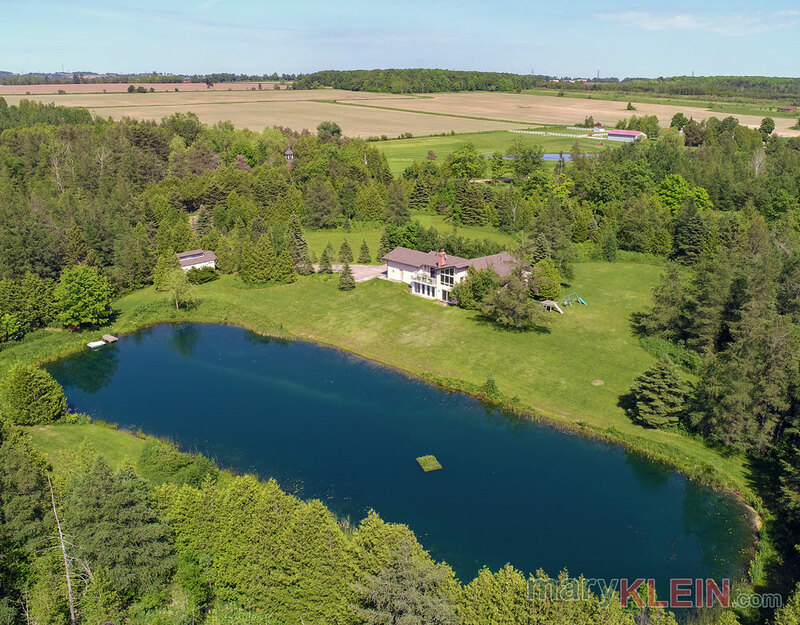 The property is under the Grand River Conservation and a tax credit is applied for each year by the homeowner. 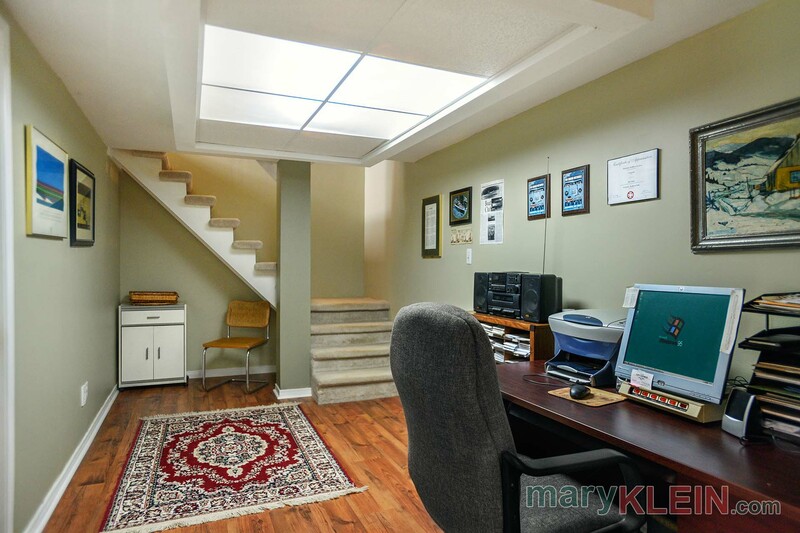 Taxes for 2016 were $2,892. Included in the purchase price: 2 garage door openers and remotes, 2 kitchen bar stools, fridge, built-in cooktop & oven, dishwasher, stackable washer & dryer, all electric light fixtures and window coverings, stand up freezer, central vacuum system & attachments, water heater, basement fridge, electric fireplace. 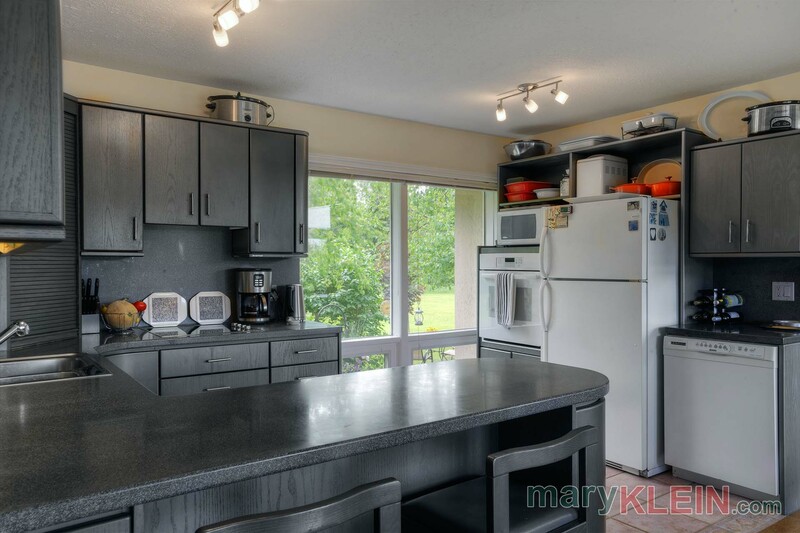 Rental water softener, propane tank & sentinel light. Internet provider for the area is Bell with a NetGear hub. 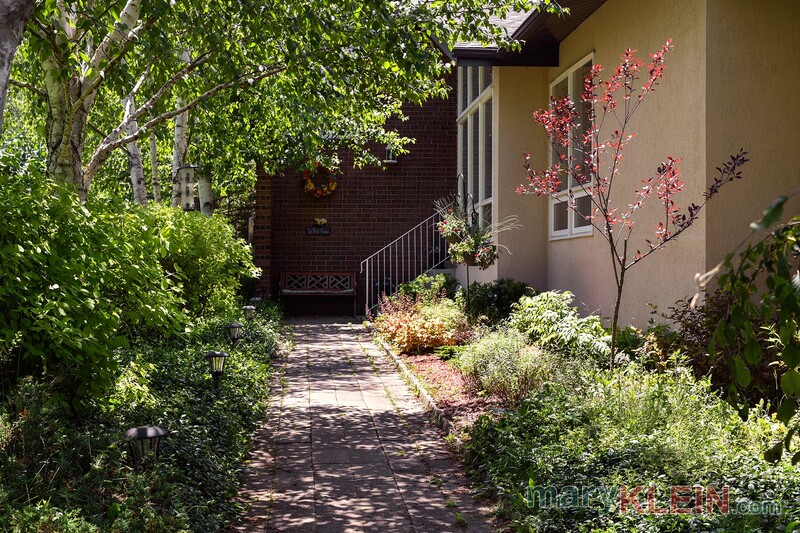 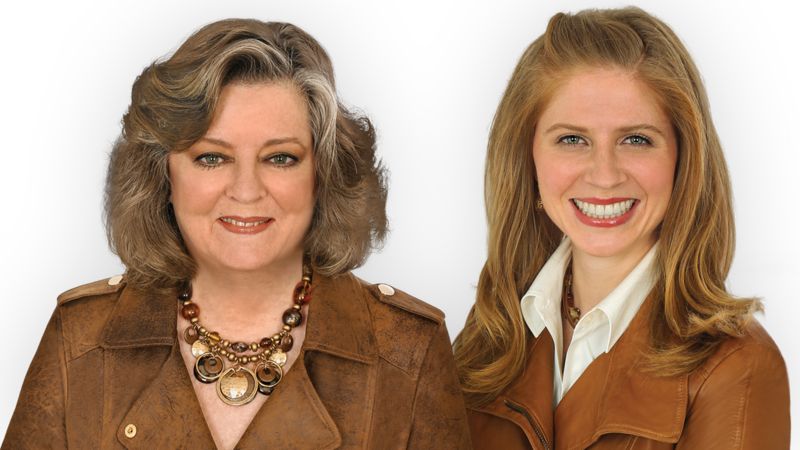 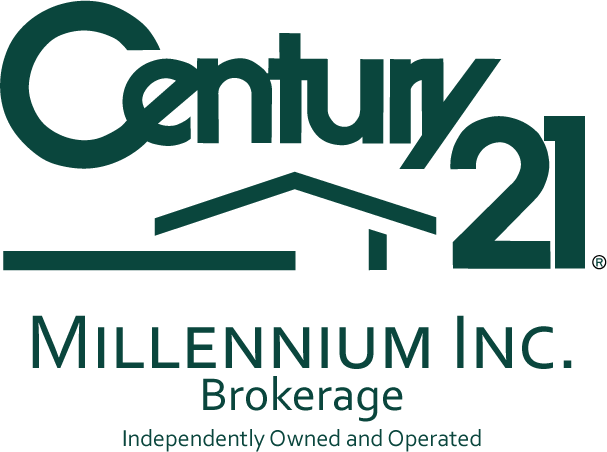 The Sellers would prefer a mid to end of September closing, but can be flexible if necessary. 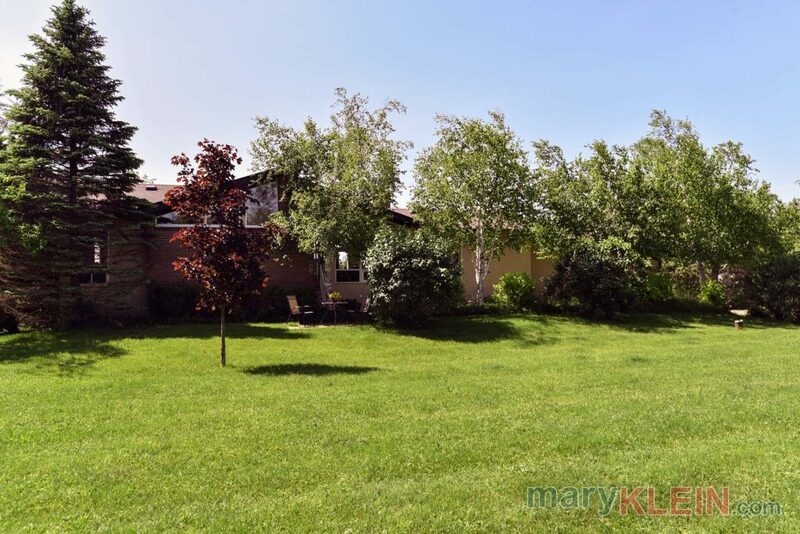 Do you Have a Question About This Property Located in East Garafraxa?